Have fruits and vegetables become less nutritious? In spring we feel motivated to reconnect with the environment and eat healthier so, we pile more fruits and vegetables onto our plates. But, which fruits and vegetables are the healthiest? ‘Superfoods’ have long been thought of as the best foods. But, it may be time to push ‘superfoods’ to the side and leave room for some new foods as some experts are saying the healthiest foods we can eat are some of the least consumed. Three kinds of evidence suggest the fruits and vegetables we are eating today are less nutritious. Studies show an inverse relationship between crop yield and mineral concentrations. When low- and high-yield cultivars of broccoli and grains are grown in the same field, researchers found the high-yield crops had lower concentrations of protein and minerals. When data of produce from 1950 was compared to data from 1999, they found a 5 to 40 percent or more decline in some minerals, vitamins and proteins. Research published in the Journal of the American College of Nutrition compared the nutrient values in 43 garden crops and found the levels of some nutrients (protein, calcium, iron, riboflavin and vitamin C) were statistically lower in 1999 compared to 1950. Why? The researchers attest the decline in nutrient values to soil depletion and the use of larger, higher yield crops in modern agriculture: crops grow so fast they are less able to manufacture nutrients or absorb them from the soil. A similar study from Britain also reports produce grown with current agricultural practices contain fewer nutrients. The farms are not the only factor influencing changes to the nutrient value of our fruits and vegetables. Our love of sugar has transformed our produce aisles. Did you know that we eat more fresh potatoes and bananas than any other fruits or vegetables. Apples and corn are the next most commonly consumed produce. Such fruits and vegetables are sweet, pleasing our sugar-loving palates. Consumer demand for sweeter tasting produce has changed the produce aisle. For example the emergence and growing popularity of the very sweet HoneyCrisp apple. Or, our love of Sweet Corn which 10 times sweeter than ordinary corn and can contain up to 40 percent sugar. Robinson notes that we should re-consider vegetables long forgotten. For example scallions, or green onions, have more than five times more phytonutrients than many common onions – the green ends being the most nutritious. Pick foods from the wild, or grow them in your own yard. Also, you can include herbs and spices in your diet. Herbs and spices they have been relatively unchanged by modern agriculture. Seek out produce with shades that are richer or darker than the conventional produce. Look for dark purples, reds and greens at the market. Why not give purple carrots, rainbow chard or blood oranges a try? You may also try seeking out bitter tasting produce, such as broccoli or turnip greens as many of the most nutritious nutrients are bitter tasting, and it may help steer your palate away from sweets. Choosing organic produce also increases the nutrient content of your produce. According to a meta-analysis based on 343 peer-reviewed publications, there is significant difference between organic and conventionally grown crops. The study published in the British Journal of Nutrition notes the concentration of a range of antioxidants were substantially higher in organic crops, with phenolic acids, flavanones, stilbenes, flavones, flavonols and anthocyanins being an estimated 19% higher. In addition, pesticide residues and the toxic metal cadmium were found to be four times higher in conventional crops. Buying local produce helps reduce nutrient loss that occurs after harvest. Once a crop is picked it begins to breakdown and lose nutrients. Local produce requires less transit time from farm to fork helping boost nutrient content. Baranski, M. et al. Higher antioxidant and lower cadmium concentrations and lower incidence of pesticide residues in organically grown crops: a systematic literature review and meta-analyses B J Nutr 2014;112:794-811. Davis, DR et al. Changes in USDA food composition data for 43 garden crops 1950 to 1999. J Am Coll Nutr 2004 Dec; 23(6):669-82. 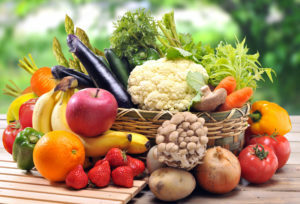 Davis, DR. Declining Fruit and Vegetable Nutrient Composition: What is the Evidence? HortScience February 2004;44(1):15-19. NY Times. Breeding the Nutrition Out of Our Food. Jo Robinson, May 25, 2013. Scheer R and D Moss. Dirt Poor: Have Fruits and Vegetables Become Less Nutritious? Scientific America, April 2011. United States Department of Agriculture: Economic Research Service. Tomatoes and Potatoes are the most commonly consumed vegetables. 2011. United States Department of Agriculture: Economic Research Service. Bananas and apples remain America’s favourite fresh fruits.